Aimee’s and Marion’s Excellent Food Journaling Adventure! I begin each day with the best intentions that today is the day I buckle down, start that food journal and get serious about shedding those last 20 pounds. A few days later a Weight Watchers coupon comes in the mail and I remember how I’m supposed to be taking charge of my eating, cleaning it up and controlling my portion sizes. I contemplate a return to WW but then I convince myself that I have the tools right here in this brain of mine to do what it takes to get this weight off once and for all. I know I will feel better and I will run faster without the excess weight. I know the doctor will be pleased with my efforts. I know I will love the results because I will better than ever. Yet nothing ever seems to happen. My scale has bounced around the same 4 pounds for months now. Up/down and the cycles continues. So why am I such a flake? I do think, in my case that there is a correlation between food management and my flakiness if you will. I’ve got the fitness part of healthy living under control, but I still struggle with the food aspect. It’s as though I use my activity as an excuse to eat without limits. I know this wasn’t written with me in mind, but if it was I would say thank you for calling me out on a really bad habit and for providing some realistic tips to help me curb this terrible behavior. The credit for the design and title of our project goes to Marion, but it’s as though she read my mind. I am in a place in my health journey where I really want to analyze the food I eat, the decisions I make related to food and how I can improve my diet so I begin to lose weight again and more importantly keep it off. As a former Weight Watcher I loved the idea of the meetings, but I always left feeling somewhat cheated and disappointed. The leaders are clearly following a lesson plan of sorts for the meeting and once they got through their material there was little time for anything else. What I wanted was to hear about how everyone was doing, not just weight loss or gain. I wanted to know about anything helpful they might have learned over the week, successes, new recipes or healthy low point snacks. This will be almost like the WW meeting I always dreamed of. If this interests you please join us. Marion and I would love to hear your ideas or input on our posts. We also welcome encouragement and motivation! To get this show on the road here is my food journal from yesterday, February 2, 2012. Reflections: I definitely didn’t need the 2 brownies. I justified the first as a taste test before my family was subjected to such horror! The second was just because I wanted more. Readings: I read this article in the New York Times a while ago and wanted to post about it, but I didn’t get around to it. It’s called “Is Sugar Toxic?” by Gary Taubes and addresses the link between processed sugar and their negative impact on the body. I have thought about trying to go cold turkey to eliminate as much sugar as possible from my diet, but that isn’t realistic for me. I just don’t work that way. I’m hoping to explore ideas and solutions through my food journal. Thoughts: I wasn’t hungry at all. I was satisfied and really enjoyed my food. In thinking about the brownie issue I wonder if simply letting my husband know that I only wanted to eat one might have decreased the urge to go for that second? It wouldn’t hurt to try this in the future. Want to see what Carlos and I have been up to this week? It's just like riding a bike...no really! 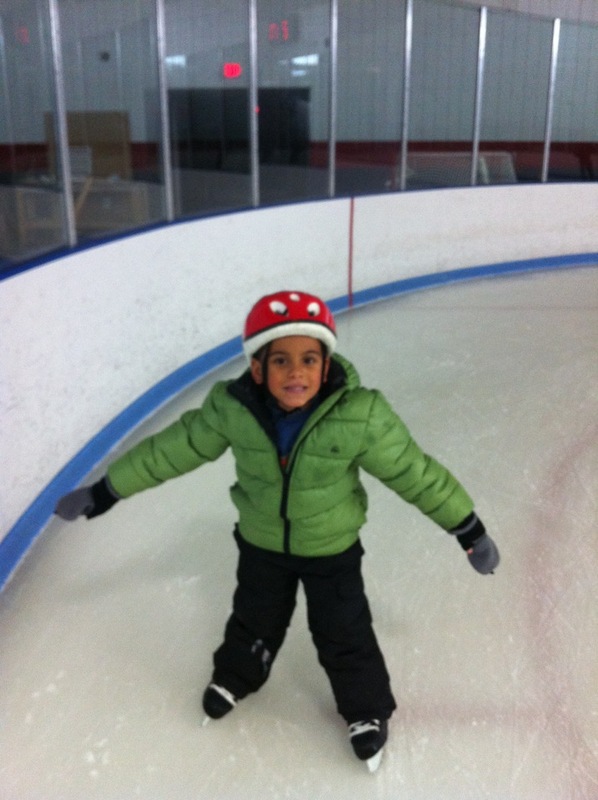 Carlos starts ice skating lessons tomorrow, but he missed the first few classes so I thought it would be a good idea to try it out before his lesson. Oh my goodness so much fun! 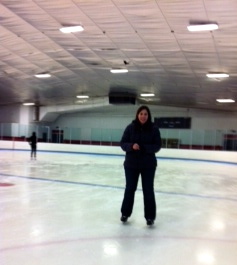 I haven’t ice skated in probably 30 years but I was quite proud of myself. I didn’t fall once. We’ve been twice since Wednesday! I feel like you, Marion, and I are kindred spirits! I also have fitness in the bag, but my diet is the problem. I have been doing a lot better since the beginning of this year, but I all of a sudden got this sour stomach thing (after doing a LOT of research, because this has never happened to me before) I think that the stress of the changes going on in my life are effecting my health, and keeping a food journal is one of the best things I should be doing right now! I have a feeling that whole last sentence didn’t make sense, but my point is that I am eager to join you guys in this little endeavor! I will start next week (hopefully my stomach will be back to normal by then)! Great idea! Hi Aimee! You did a good job with this post. I am going to try more Indian veggie cooking, mostly because I love the spices and hate boring vegetables. But that yummy sounding recipe seemed far too detailed for me–I’m starting with something easier!<<just knowing my personal lack of motivation in the kitchen. I have heard from oldest daughter that her friend uses coconut milk in the curried vegetable recipe that we currently make at home. Love the food journaling idea…I’ve actually been journaling since Jan 1st, but probably not very mindfully. I write what I eat, but not much more! I think I may join in! I like the idea of taking the typical food logging another step and adding in reflections and such. I’ve been tracking my food and exercise pretty faithfully for the last year, but I don’t really think too much about how I feel when I eat (or what it is that causes me to overeat when I do). Keep it up – sounds like you’re on a good path! Hannah and I used to go ice skating on Friday nights when she was little because for 2 hours you could rent skates for $1 and skate for $1 – since I was a poor single Momma then, it was a cheap date – she was skating circles around me by the end of the first month! I have to say, the saying, “Failing to plan, is planning to fail” is SO true. Here’s to everyone being prepared so we don’t feel overwhelmed in situations where we are confronted with something outside of our “planned” decisions!!!! the ice skating looks so fun! Keeping a food journal has really helped me on my journey. You would be amazed at what you forget you have eaten in a day! Good luck with your weight loss, you can do it!